Rabbit In The Headlights: They're Here! I feel like it's God's way of telling me everything's going to be all right. I've ordered them, but don't we still have a bit before they actually show up??? Girl scout cookies got me through my husband's deployment last year. Especially the thin mints. This year I am re-committed to working out regularly... She said as she ate chocolate cake at 2:40am EST. I usually have 5 piano students that sell them each year. So logically you buy 5 boxes form each student. After all fair is fair. This year only one student is selling them, I am felling so deprived, I might go through cookie withdrawal. It is going to be a bad few months. Erin has wanted to be a girl scout forever! I don't really like my kids involved in a lot of extra curricular stuff so my first thought when the registration forms came home was that I didn't really want her doing it. Until I remembered she could sell me cookies and no one would ever know how many I ordered. And, that's all I'm going to say on the matter. 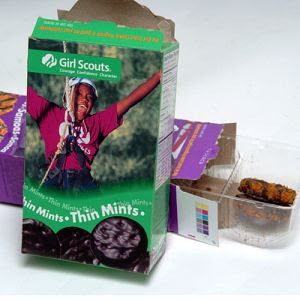 Oh, but, also too, a friend told me last night that if you freeze a thin mint, and then put a little bite in each end, you can drink hot chocolate through the cookie. Apparently it is quite the treat. Seems like the wasting of a good cookie to me since I"m really a cookie purist and not so much a hot chocolate fan. But, I told her I would try it. Oh dear, the thin mint!! And just when I made my new resolve to lose these unsightly thin-mint pounds from last year. It sounds like I need to hunt down our local Girl Scout. I knew it. This really is what the burn was about. I knew it. My niece called and asked if I wanted to buy some from her. I said, "Heck yea". She is mailing them from Oregon so I didn't want to waste her time...so I bought 10 boxes. Didn't seem like much at the time, but MAN that's alot of cookies to hide from Dan and the kids! Anyone have a storage unit? Mort baby farm: I have a storage unit - it's called my THIGHS. Ok, thanks a lot. How the heck am I supposed to get those all the way here to Mexico now that you have me craving them? Is it too late to order? I'm thinking the embassy should ship those babies here to keep morale high. nice article. I would love to follow you on twitter.